When a father who dreams of flying goes off to war and does not return, his son decides to make the dream come true. 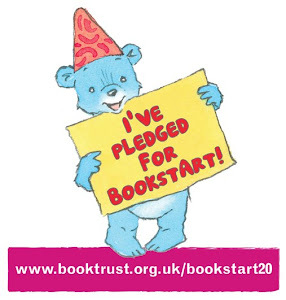 Grahame Baker-Smith’s moving story, with stunning illustrations, shows how, with love and a bit of ambition, you can reach seemingly impossible goals. For our sixth Picture Book Saturday we received FArTHER and I am very grateful to Templar for sending me a copy to review and to hold and love. This gorgeous book won the Kate Greenaway Award 2011 and a more worthy winner would be hard to find. Not only are the illustrations whimsical and creative and beautiful, the story is wonderfully touching. It is completely from our main character's point of view. In a few words he explains his father's obsession with flying. He is always thinking about it, puttering around in his workroom making fantastical flying contraptions that somehow just just lack the ability to fly. The boy says how he then crawls into his father's lap until his father remembers that he's there. Then his father would grab him, and run with him and they would spend time on the beach, laughing and playing and flying kites. But that is until his father gets that look in his eye. And once again the boy is left to his own devices as his father starts tinkering with his creations yet again. The story moves on from there, but to tell it here would be unfair. FArTher is meant to be read by parents to their children. It is meant to be read by adults so that they can remember where they come from. It is meant to be read by teens to remember that once upon a time, not so long ago, they were that small and that confused by their parents lives and that following your dreams may not be a bad thing. 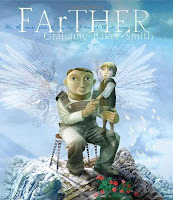 I adored FArTher (a lovely play on the words further and father that you will understand once you've read the book) and it made me really miss my own dad with his own crazy ideas and whimsical dreams. But even more important is the core central message of "never stop dreaming" and I heartily approve. I think that FArTHER has become my picture book of the year thus far and I will definitely want some of the whimsical pieces of art by Mr. Baker-Smith for my walls here at home. Do visit here, for a look at some of his illustrations.